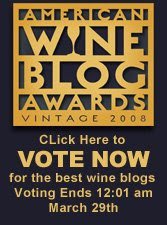 Voting opened today for the 2008 American Wine Blog Awards. Tom Wark developed these awards last year to recognize the quality of wine writing and the depth of coverage that is available every day--for free--on blogs all over the internet. The Awards work through a process of open nominations, the selection of finalists from those nominations by a panel of five judges, and then voting in which 70% of the decision will be determined by open voting (not Chicago style, folks! one person, one vote) and 30% by the judges. Voting will continue until March 29 at 12:01 AM. Wonderful blogs are on the list for your consideration--and I do mean consideration. Please take the time to look at all the blogs nominated in each category before you cast your vote. Browse around through some older posts while you're there. And my sincere congratulations to all those many bloggers who were nominated by readers in the initial stages of the process, as well as to those who were named as finalists. After all, most bloggers blog because they hope to reach an audience. Nominations are the best proof that we have succeeded. Yesterday, I thought a great deal about a colleague of mine who truly believes the following: "a rising tide lifts all boats." Tom wanted a rising tide of recognition to lift all wine bloggers and to give credibility to the work that they were doing to promote wine knowledge. Every wine blog reader and writer is contributing to this rising tide, and that's a good thing. Congrats! You've got my vote (though I think I may have to spread the love and pick one or two categories rather than all three!). Very well deserved on all counts. From one nominee (Best Graphics) to another, I wish you good luck!